Derek Sloan is more than shocked when someone mysteriously delivers a baby to his office. Kayleigh Mitchell naturally steps up to help her boss, and soon hopes he'll see her as more than just a temporary solution. What an absolutely fun Valentine story. You see the progression of a longing that is finally fulfilled but not exactly the way Kayleigh Mitchell had always dreamed about. Derek Sloan never knew Kayleigh existed but once he does he can’t forget her or let her go. Or can he? Not strictly because he seriously needs her to help care for this baby. Two hearts collide at the right time. I give this 4 stars. When Nicole Taylor rediscovers the father of her child three years after their one wild night of passion, Josh Masterson is determined to prove there's still a chance for their own happily-ever-after. Very cute story. Interesting concept how the author takes something we all dream about cutting lose one or another, even not being ourselves for just one night. You know to not have to worry about anything except the moment. But like everything else it comes with a consequence. In this case in the form of a child Ellie nine months later. The only thing is even with Nicole Taylor and Josh Masterson feeling emotionally bonded and feeling that their hearts had connected forever during their one night of pure passion. They had only exchanged first names. Problem #1: One of them gave a false first name and had a fiancée. Problem #2: One skipped out while the other was sleeping leaving no note or number. I give this 4 stars. Jake Knight came home one night to find trouble on his doorstep-times two. 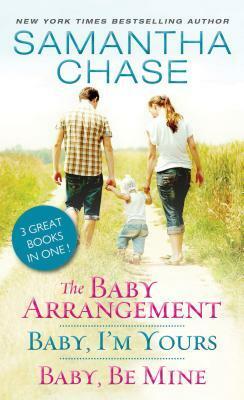 With infant twins to care for, Jake desperately calls on a heartbroken ex for help...and the more time he spends with Olivia, the more he wants this makeshift family to be permanent. When love steals your heart, fate throws you a mean curveball, and circumstances says, “Come on boys let’s shake these two up a little.” You’re in trouble. That is what happens to this last couple Olivia and Jake. They grew up together. He is 6 years old than she is and her Brother Mike’s friend. On her 18th birthday she takes charge and steals a kiss from him in the garage during her birthday party. He starts to go along with it then pushes her away and gives her a look of disgusts. Eight years later he is thrust into fatherhood when he happens to be home when his ex-fiancée turns over his twins to him. Mike calls her for help when she is home visiting. Really? See how sideways this can go quick. I give this 4 stars. Overall, found the books fun to read and they are fun for Valentine's day. But the guys were all Alpha Males during personal crisis yet they sure did a lot of whining. Personal choices are hard. Better to make before the wrong one comes back to bite you in the a--. Good thing about these stories is that they had strong women there to support and back their play. I give these books 4 stars overall. Provided by netgalley.com. Follow us at: www.1rad-readerreviews.com.